We created this blog about five seasons ago with the intent for it to be a place to get information about the on-the-diamond Tacoma Rainiers. Information about things the Rainiers are selling can be found elsewhere and we don’t do that in this space. Except we are today, because this “We R Family” deal that the team is currently marketing is amazing. For a total of $250, you get as many as eight tickets for every Monday-through-Thursday game during the 2015 season. There are 36 weekday games on the schedule, but a family of four only needs to attend five games to break even on the total cost. Attend more than five games and you are saving money on the get-in price. On top of that, the 2015 schedule is very family (and weather) friendly this season: only nine of the midweek games are during April and May when school is in session – meaning that 27 of the available dates for this plan are in June, July, and August. Up to eight people, for as many as 36 games, for a flat fee of $250. That is a crazy deal. More information is here. Ryan Divish blogged about the Kyle Seager contract extension and shared his opinion on a Mariners trade rumor. At USS Mariner, marc w has a post about the development of Seager which evolves into interesting thoughts on player development. Mariners catching prospect Steve Baron is ranked by Baseball America as one of the ten most likely players to be selected in the Rule 5 Draft. Several other lower-level Mariners prospects are noted in this article. Greg Johns runs through the available right-handed hitters still on the market. Jon Heyman also looks at Mariners right-hand hitter options. Head into Thanksgiving Weekend with this list of the nine worst baseball movies. Someone turned the Hot Stove League up to eleven as we have all kinds of things going on now. First and foremost, there are multiple reports from all kinds of sources (but not the Mariners themselves) that Seattle extended Kyle Seager‘s contract for seven years – reportedly to the tune of roughly $100 million. That’s Panda Money right there – which makes sense, since Seager is better and younger than Sandoval right now. The deal covers Seager’s final three seasons of arbitration eligibility and his first four years of free agency. More details can be found in the links below. On the minor league front, 2014 Tacoma Rainiers Pitcher of the Year Logan Kensing signed as a free agent with the Chicago White Sox. It’s a minor league deal with an invitation to big league spring training. Kensing was a PCL All-Star and had a great year for Tacoma. His only problem was that the Mariners bullpen was so good this year that he never got a chance to be called up. Going to the White Sox is a smart move for the veteran: their bullpen was awful in 2014, so maybe Kensing can make the team in the spring. Two former Rainiers signed with the San Francisco Giants. Catcher Guillermo Quiroz re-signed with San Francisco on a minor league deal. A former Mariners and Rainiers receiver, the friendly Quiroz was with the Giants throughout their World Series run and was there for the celebration despite not being on the active playoff roster. He was essentially an insurance policy: if one of the Giants two catchers was injured during a playoff game, Quiroz was there and ready to go for the next game. The Giants also signed ex-Rainiers infielder Carlos Triunfel – who was a free agent for the first time in his career. Both Triunfel and Quiroz are likely to play for Triple-A Fresno Sacramento in 2015. Our division rival Reno was active adding PCL veterans over the weekend. The Arizona Diamondbacks signed PCL bats Nick “Chili” Buss and Jamie Romak to Triple-A contracts. Both are hitters who should thrive in the high-elevation of Reno. Buss had an all-star season for Albuquerque in 2013, driving in 100 runs. His numbers came back to earth at pitcher-friendly Sacramento last year. Romak hit 22 homers for Memphis in 2013 and 24 more for Albuquerque in 2014, and he made his MLB debut in 2014. We’ll start with Ryan Divish’s story on the Kyle Seager contract extension. Dave Cameron analyzes the Seager deal. Buster Olney ranked Seager as the 4th-best third baseman in MLB. The Mariners were granted a rare fourth option year on Danny Hultzen, Bob Dutton reported in a Saturday notebook. That means Hultzen can pitch in the minor leagues in 2015. Shannon Drayer has a blog post on Tacoma catcher John Hicks, who was added to the 40-man roster last week. In his always-entertaining Sunday notebook, David Laurila at Fangraphs includes an anecdote about new Rainiers manager Pat Listach hitting his first Major League home run. A week’s worth of minor league transactions are right here. The Mariners signed Jim Leyland‘s kid Patrick Leyland, who was let go by the Tigers – he’s a Class-A catcher. The Hall Of Fame ballot was revealed today, and former Mariners Edgar Martinez and Randy Johnson are on it. This is Johnson’s first appearance on the ballot – which is so loaded that Rob Neyer is calling it the Hall Of Fame Megaballot. Check back Wednesday for a post leading into the Thanksgiving weekend. The Mariners had to set their 40-man roster prior to the Rule 5 Draft by 9:00 pm yesterday, so that caused a bunch of moves to be made. The team added prospects John Hicks, Ketel Marte, and Mayckol Guaipe to the 40-man roster. Hicks and Marte finished last season with Tacoma and will probably return to the Rainiers in 2015. Guaipe is a relief pitcher who had good numbers at Double-A Jackson in 2014 and I suspect we’ll see him in Tacoma next year, too. Not getting protected on the roster was Tacoma’s 2014 standout pitcher Jordan Pries. The team must believe that they won’t lose him in the Rule 5 Draft – we’ll find out next month. We lost one of our stalwarts when the Mariners traded infielder Ty Kelly to the St. Louis Cardinals for Double-A starting pitcher Sam Gaviglio. Kelly played very well in his one-and-a-half seasons with the Rainiers, but there wasn’t much opportunity for him in the big leagues with Seattle – hopefully he’ll get a better chance with the Cardinals. The Cardinals added Kelly to their 40-man roster, so that’s a good sign. Gaviglio is a right-handed starter out of Oregon State – he was the Cardinals 5th round draft pick in 2011. He pitched for AA-Springfield last year, going 5-12 with a 4.28 ERA in 24 starts. Two stats stand out on his page: he had a 126-to-46 strikeouts-to-walks ratio in 136 innings, and he surrendered only eight home runs. The Texas League is tough on pitchers so the stat line is pretty good (other than the dismal win-loss record, but he can’t control that). Gaviglio will have a chance to make the Tacoma starting rotation out of spring training. The Mariners claimed left-handed relief pitcher Edgar Olmos off waivers from the Miami Marlins. Olmos split 2014 between Double-A Jacksonville and Triple-A New Orleans last year. In the PCL, he appeared in 33 games and went 2-3 with a 3.86 ERA. He pitched twice against Tacoma in August, with the Rainiers handing him a loss in the 12th inning to finish a 4 hour, 48 minute game on the August 14th. Olmos is bullpen depth. He is on the 40-man roster and he has one option year remaining, so he is a very strong candidate to be with the Rainiers next season. Outfielder Xavier Avery is the first of the 2014 Tacoma players who was a free agent to sign with another club. Today the Detroit Tigers inked Avery to a minor league deal and invited him to major league spring training. Avery spent the entire 2014 season with Tacoma, appearing in 120 games. He batted .275 with ten homers and stole 31 bases. His most memorable part of the season came in El Paso at the end of June: after hitting just two home runs all season up to June 27, he launched four homers in three days against the Chihuahuas. If Avery goes to Triple-A with the Tigers organization, he’ll be playing for the Toledo Mud Hens. Two of my favorite Rainiers from the past were hired by the Philadelphia Phillies as minor league coaches. Former catcher Pat Borders was named manager of the Williamsport Crosscutters of the short-season New York-Penn League. This is Borders first job in a non-playing capacity. The Phillies also hired Brian Sweeney to serve as pitching coach for their rookie-level team in the Gulf Coast League. Sweeney will work with teenagers down there – many of whom will be in their first professional season. Sweeney and Borders share a trait: both continued to play in Triple-A as they approached age 40 (or in Borders case, beyond 40), mostly for a love of the competition. These are the type of men who become good coaches. Bob Dutton rounds up all of this news in his Mariners notebook. Here is the report on Xavier Avery signing with the Detroit Tigers. You will see a distinct ex-Rainiers flavor in the list of Phillies minor league coaches. The main reason: former Mariners front office folks Pat Gillick and Benny Looper are calling the shots in Philly. The Salt Lake Bees have a new manager: former major league infielder Dave Anderson. Want to get lost on the internet on a Friday afternoon? Enjoy Grantland’s MLB transaction trees. Credit Rainiers executive Jim Flavin for the solid link. A fellow Rainiers executive – Ben Spradling – requested I link to this story. Please don’t click on it – you will regret it. The Seattle Mariners and Tacoma Rainiers announced on Tuesday that Pat Listach will be the new Tacoma manager for 2015. This marks the second year in a row that the Mariners have gone outside of the organization to hire a Triple-A manager. They did the same thing last year, hiring Rich Donnelly to manage the Rainiers – only to have plans change during spring training, with Donnelly ending up was the major league third base coach and Roy Howell taking over Tacoma. Howell managed the Rainiers to a 74-70 record last year – and he’ll stay in the Mariners organization. He was supposed to be the Double-A hitting coach last year before the dominoes fell during spring training, and he ended up doing a fine job as Tacoma manager. I suspect he’ll go back to his prior role as hitting coach – possibly at Double-A Jackson, where he was expected to be last season. Rainiers fans should be excited about Listach running the club. Listach last managed in the Pacific Coast League in 2008, leading the Iowa Cubs to an 83-59 record and a first-place finish in the American-North (they lost to Oklahoma in the American Conference playoffs, three games to two). Listach was named the PCL Manager of the Year for his efforts. At that time, Listach was considered to be a strong major league manager prospect. Lou Piniella was the Chicago Cubs manager, and he recommended Listach for a big league coaching job in Washington. Listach served as a third base coach for the Washington Nationals and manager Jim Riggleman for two seasons, 2009-2010. Listach left the Nationals to take an opportunity as the Chicago Cubs bench coach under then-manager Mike Quade (bench coach is considered a better job than third base coach for aspiring managers). Listach survived two tumultuous and ultimately very Cub-like seasons in Chicago before being let go after the 2012 season. The Dodgers hired Listach to work with their minor league infielders during the 2013 season, and then he returned to the big leagues as Houston Astros third base coach in 2014. That lasted one season, as the Astros manager and staff were flushed out, and now Listach will be managing in Tacoma. That’s a lot of stops over a short period in the big leagues, but a theme can be seen: Listach has been a coach for three poor teams that had no chance of winning right away, and twice when changes were made he was one of the guys looking for a new job. That’s the way it goes on the big league coaching carousel. The revolving door of managers and coaches is exactly how Listach got his first managerial opportunity: he was serving as the Iowa Cubs hitting coach in 2002 and had never managed before. The Chicago Cubs made a mid-season move, firing manager Don Baylor and promoting Iowa manager Bruce Kimm to big league skipper. They asked Listach to stay with Iowa and manage the rest of the season – and he went 27-28 the rest of the way, decided he liked it, and a few years later was managing at the Double-A level in the Cubs system. Listach is only 47 years old, and he still has a chance to be a major league manager. Being in charge for another season – even if it is at the Triple-A level – can get him back on that path. The remainder of the 2015 Rainiers coaching staff will be announced soon – but as a preview, I’m not expecting any changes. In the meantime, let’s welcome Pat Listach to the Tacoma Rainiers family! We’ll start with the The News Tribune’s story on the Pat Listach hire. Included is a list of all Tacoma managers since the city fielded a PCL team in 1960. Listach was a finalist for the Texas Rangers third base coach job, but when that didn’t work out he accepted the Mariners offer. Like all Tacoma managers, Listach will also coach third base. This 2009 story from the Washington Post details his strategy. Listach has a reputation as a terrific coach of infielders. When Listach was let go by the Chicago Cubs, second baseman Darwin Barney gave Listach a lot of credit for his record-setting errorless streak. As a player, Listach is most known for winning the 1992 American League Rookie of the Year award. As detailed in this story, he was given an unexpected opportunity due to an injury, and he took advantage of it. The story includes some personal details on Listach. Thursday is a big day in the off-season maneuverings of MLB teams: it’s the deadline to set the 40-man roster prior to the Rule 5 Draft. Bob Dutton has a look at the Mariners players who may need to be protected. Ryan Divish thinks that Braves outfielder Justin Upton may be available via trade, and he notes that the Mariners could be in play this time around. Sad news: a historic stadium in the Dominican Republic was destroyed by fire. This is the home of Aguilas Cibaenas – currently Mariners Minor League Co-Player of the Year Jordy Lara is playing for this team. Here’s an interesting story on the struggles top prospects are facing when they make the jump from Triple-A to the major leagues. The takeaway: video scouting seems to favor the pitchers when a hitter first reaches the majors. They are putting together the broadcast team for the 2015 Chamber’s Bay US Open. I guess this thing really is going to happen, eh? Our next blog update will come on Friday. Those are PCL cities, but the score was actually from the opening stages of an NBA game. It brought a question to mind: which PCL cities have Major League teams in other sports? Let’s run down the list. I did not include soccer*. Salt Lake City – NBA Jazz. Des Moines (Iowa) – none. Oklahoma City – NBA Thunder. Nashville – NFL Titans, NHL Predators. New Orleans – NFL Saints, NBA Hornets. Round Rock (Austin, TX) – none. PCL cities overlap with five NBA teams, two NFL teams, and one NHL team. When I was first hired by Tacoma, we had three more NHL cities in the league: Calgary, Edmonton, and Vancouver. The PCL decided to move out of Canada (author’s note: Booooooooooo!!!!) and now we are down to one NHL city. I think the next change on this list will be in Las Vegas, where they are apparently close to securing an NHL expansion team. Anyway, I think it’s kind of a fun list to look at. Robinson Cano broke a toe when hit by a pitch during the MLB All-Star trip to Japan early on Saturday morning. Fortunately it should heal naturally in 3-4 weeks. Hisashi Iwakuma had a rough outing in his native country on Friday. The Mariners have re-signed Leury Bonilla and we can look forward to seeing him in Tacoma again next season. Also learned from Baseball America’s minor league transactions: they signed another obscure Cuban left-hander (the last time they did this “obscure Cuban left-hander” turned into Roenis Elias). Bob Dutton’s Mariners notebook from Sunday has some winter league notes, including good news on Erasmo Ramirez and Patrick Kivlehan. Buster Olney ranked the top ten catchers in the majors, and Mike Zunino comes in at No. 10. Jack Z has some interesting things to say about Zunino (subscription required). I am not interested in playing poker with Tacoma Tigers alum Jose Canseco because it is gross. The hot stove league really warmed up today, with Russell Martin signing with Toronto and the big Braves-Cardinals trade. The off-season is just getting started! * Is MLS the best soccer league in the world? If so, it should be included but I don’t think it is yet. Maybe someday. We lost one of our all-time greats this week. Original Tacoma Tigers slugger Kelvin Moore passed away at the age of 57 on Sunday due to cardiac arrest in his home state of Georgia. The Oakland A’s made the announcement. Moore was the star of the 1981 Tacoma Tigers – the second year Tacoma’s Triple-A club held the Tigers name, and the first year of its affiliation with Oakland. The A’s/Tigers union lasted through 1994. Moore’s 1981 season still stands as one of the all-time greats in Tacoma franchise history (which dates to 1960). A right-handed first baseman, Moore hit .327 with 31 home runs and 109 RBI, leading the Tigers into the PCL playoffs. The team won the opening round against Hawaii before losing to Albuquerque in the PCL Championship Series. Moore was not with Tacoma during the PCL playoffs. Oakland A’s manager Billy Martin noticed what he was doing up in our neck of the woods, and he made Moore a late-August call-up as the big league club was on a playoff push of its own. Moore made the A’s playoff roster and he even got a couple of hits in the ALCS against the Yankees. 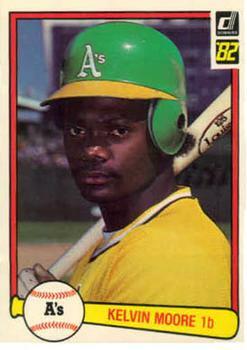 Moore returned to Tacoma in 1982 and saw his batting average fall to .264 but he still ripped 21 homers with 82 RBI. He appeared in just 35 more Triple-A games in 1983, adding five more dingers. Moore’s 57 career Tacoma home runs ranks 8th on our all-time list, and his 213 RBIs is 10th all-time. Kelvin Moore’s Major League career was pretty brief. Here is his baseball reference page. By now you know that Felix Hernandez did not win the American League Cy Young Award. He finished a very close second to Corey Kluber of the Cleveland Indians. I was surprised by this result – I thought Felix had it in the bag, even though the stats are very close. I figured his star power and standing as a previous winner would help carry him in a tight race. I was wrong. Lots on this in the links below. Jake deGrom of the New York Mets won the National League Rookie of the Year award. He pitched against Tacoma in April. deGrom opened the season with Las Vegas and faced the Rainiers on April 26 at Cashman Field. The Rainiers managed seven hits and two runs against him in five innings (Gabriel Noriega doubled twice off deGrom). However, deGrom and the 51s won the game, 11-3. He was in the big leagues shortly thereafter. deGrom made two more Triple-A starts before the Mets called him up in mid-May, and then he rolled right on through the NL. Here is the AP story on Kelvin Moore‘s death. Larry Stone dug into the Corey Kluber – Felix Hernandez balloting, and even spoke with some voters who put Kluber No.1 on their ballots. Bob Dutton has the news story on the Cy surprise, with lots of reaction. John McGrath had a Cy Young vote, and he put Felix No. 1 and Kluber No. 2. He explains why in this column. Ryan Divish explains the difference in the vote tally. On his blog, Divish goes into way more detail and has some links to national perspectives. We have a rare USS Mariner post, as Jeff Sullivan wrote about the situation. One of the Mariners prime off-season targets is no longer available – Victor Martinez re-signed with the Detroit Tigers. The New York Mets are eyeing our shortstops, Adam Rubin reports. Ex-Rainiers star Mike Morse has a new best friend. The official list of minor league free agents came out, and several 2014 Rainiers players are on it. As expected, Logan Kensing, Xavier Avery, Blake Beavan, Nate Tenbrink, and Leury Bonilla are all free agents. You might recall I was unsure if all-star infielder Gabriel Noriega qualified for free agency. It turns out that he does. I wouldn’t be surprised to see the Mariners try to re-sign him. The major league General Managers meetings started over the weekend, and this means that the off-season rumor mill started churning. We are going to be hearing rumors involving the Mariners throughout the winter – especially since the front office stated that payroll is going to increase. Most of these rumors will concern established right-handed hitters who can play outfield or first base/DH. The M’s are definitely going to do something. We’ll have to wait and see what Jack Z has up his sleeve. If you think chasing the rumors is fun (I do! ), check the links down below. Meanwhile, the Winter Leagues continue and one of our guys has reported. Erasmo Ramirez made his first start for Cardinales de Lara in Venezuela over the weekend, working six strong innings. Two starting pitchers of note for Rainiers fans are performing well right now: James Gillheeney and Victor Sanchez. Gillheeney spent nearly all of 2014 with the Rainiers, and he had his ups and downs. But in Mexico right now, it’s all positive for Gillheeney: he’s made six starts with a 2.37 ERA, and a 21-to-5 strikeout-to-walk ratio in 30.1 innings. Sanchez spent the 2014 season at Double-A Jackson and is a strong candidate to jump to Tacoma next year. He’s with Erasmo pitching for Lara, and he’s made six starts with a 2.73 ERA. We will find out on Wednesday if Felix Hernandez wins the Cy Young Award. I think he will. Baseball America has the complete list of minor league free agents from all 30 organizations. On his Mariners blog, Ryan Divish has a round-up of the latest Mariners-related rumors from the GM meetings. Bob Dutton also has a look at the latest Mariners rumors. The Japan All-Star Series is underway and Robinson Cano had two hits in the first game. Hisashi Iwakuma starts either Thursday or Friday (your guess is as good as mine once the International Date Line gets involved). Ex-Rainiers star Raul Ibanez has surfaced as a managerial candidate in Tampa Bay. Former Rainiers and Mariners pitcher J.J. Putz has joined the Arizona Diamondbacks front office. In the PCL, Keith Johnson has a new job in the Angels organization after four years as the Salt Lake Bees manager. Congratulations to PCL Director of Business Melanie Fiore, who won the Rawlings Woman Executive of the Year Award. It’s Veteran’s Day today, so here is president Franklin D. Roosevelt‘s letter to baseball commissioner Judge Landis encouraging the continuation of baseball during World War II. You are currently browsing the Booth, Justice and the American Pastime blog archives for November, 2014.